The path to happiness is not easy and smooth. Sometimes we feel rejected, and that can make a serious dent in our happiness. Just a few years ago I was happily employed as a middle level manager. I had a good income, a company car, a laptop and phone, and nice people to work with. Then one day I was made redundant. It was a real blow and it felt like a personal insult. I was assured the redundancy was not performance related. The organisation was restructuring to cope with the recession, and I did not have the right qualification for the new role, but I took it badly I still felt miserable, rejected and humiliated. It took most of the weekend, but I managed to find a way to overcome the rejection and hurt, and to move into a better space. These are some processes that helped me not only cope, but thrive. I asked myself what were the benefits of my situation. My first happy thought was that I would no longer have to work with my immediate manager who was difficult and made life stressful for all around her. I was also thankful I was not responsible for supporting a family. Rejection often changes our plans for the future, so make some new ones. I took full advantage of free retraining that was offered and made plans to move overseas to be closer to family and friends. Most rejection says more about the other person than about you. I was made redundant because the senior management decided that the person in my role needed a qualification I didn’t have. Other times people lash out at each other because they feel bad. Being rejected is part of life and does not mean we can not be perfectly acceptable somewhere else. While I felt unwanted and unappreciated at first, I chose to see it as a business decision and not a personal insult. Consider how it affects others. Are others affected too? My workmates were the ones who had to stay and cope with my job as well as theirs. They also had to manage the difficult boss. Thinking about others helped me feel less sorry for myself and it took my mind off my own difficulties. One of my colleagues decided to fight her redundancy. It made her last few weeks bitter and unhappy and she still had to leave. By all means fight rejection if it is unjust, but if the situation is unchangeable, accept it, and work with it. Trust it happened for a reason and can be over come. Life is always changing, and the only option is to keep moving. Say to yourself; where is this challenge going to lead? If you have trouble with this, look for others that have gone through the same rejection and succeeded. In my case I didn’t have to look too far. My husband had started his own successful business after he was made redundant. I started travelling and house sitting. I love what I do now and I wouldn’t go back for any amount of money. Both people who worked in my office have also moved on because of the manager. I might have been lucky to get out when I did. Taking this road instead of the “poor me” route takes courage and perseverance. It is sometimes easier to fall in a heap and feel sorry for ourselves. After thinking things through my situation using this process, I went into work for my final few weeks feeling cheerful and happy. I was the one smiling and my workmates were the ones feeling anxious about the changes. With a few simple techniques and the right attitude, it is possible to overcome rejection and even turn it into something positive. 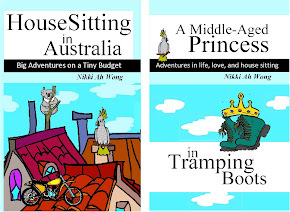 Now I have a new life that I love so much I wrote a book about it called "HouseSitting in Australia." We all get rejected some times, but with the right mindset we can move on quickly.